With new ownership of the Sac Republic FC come new renderings. The seating capacity has also bumped up by 5,000 seats to 25,000 and refining the design. The Sacramento BusinessJournals reporting both Republic and city officials have maintained the stadium would be privately financed, though the city might make a contribution in the form of developing surrounding infrastructure. Major League Soccer will not say when an announcement on a new expansion city will happen. MLS expansion into Sacramento is not certain, other cities also hoping to be chosen are St. Louis, Phoenix, Detroit, Raleigh, Tampa, Charlotte, San Diego, Las Vegas, and Indianapolis. The local office market is still on the right track. Downtown Class A vacancy rate has dropped to an 11-year low and cut in half since 2014. This should be great news for proposed high-rises downtown like 301 Tower on Capitol Mall and the ghosting Vanir tower project. There is currently an open competition to professional design firms and the public to submit ideas on how the city can help shape the Old Sacramento waterfront with new ideas. Winners will receive an award and the city will consider all ideas and select projects to implement. You can vote for your favorite entry till March 20th. It’s always strange to me when a professional design firm takes a creative license to change more than just the area of focus. Perkins Eastman does this horribly by adding eight or so building around Old Sacramento by destroying others in addition to other things not in the scope of work. Several of the concepts have fun ideas to build on, but many ideas involve busting up waterfront boardwalk the city just spent $7.7 million replacing to be ADA compliant. I’m also not loving the ideas of developing the open park space that is still in Old Sacramento. Overall, I hope the city gets some good ideas to bring more the area. It was not that long ago the city did a similar competition for the Capitol Mall, I wonder if anything will even come of that? 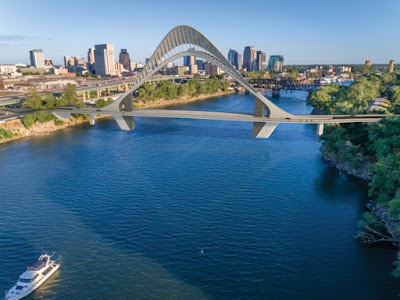 The new I Street bridge that will connect Sacramento Rail Yards with Sacramento is currently working on the first phase with the architect from T.Y. Lin International whom designed the eastern half of the Bay Bridge. The projected cost of the bridge was originally about $70 million, but this cost nearly doubled after a consultation with the Sacramento Coast Guard. The coast guard requires a gap of 272 feet for barges to pass through when the bridge lifts up. This gap is 100 feet wider than the current bridge, but this modification has doubled the projected cost. The federal government is paying for 88 percent of the bridge costs. Additionally, the city is seeking two grants: a $22 million grant from the U.S. Department of Transportation and a $7 million grant from the Sacramento Area Council of Governments. This will still leave an estimated $3 to 4 million for the city to pay. The city hopes to begin construction in 2020 and have the bridge completed by 2023. Yesterday Governor Gavin Nuwsom pulled the plug on California’s High-Speed Rail but the Central Valley segment from Bakersfield to Merced (110 miles) would be completed. Thus far, California has spent $5.4 billion on what is considered the easy stretch of the CA train. In 2008 we were also told that private money would come beating down the door once the project got underway, but you can imagine that the current expectation of private investment in the train is now nothing more than a pipe dream. We can mark this failed project as Never Built, Merced to Bakersfield is more of a monument to mismanagement and foolish ideas. A little history, the California High-Speed Rail Authority (CHSRA) in 1996 was established to begin formal planning in preparation for a ballot measure in 1998 or 2000. In 2008 voters approved a $10 billion bond to begin funding the project with construction beginning in 2016. Since 2008 the project has been plagued by delays and cost overruns. The cost to build phase one from San Francisco to Los Angeles has exploded from what we were told it cost in 2008 of about $39 billion, in 2012 it went up to $68 billion and to the most current projection is estimated at $100 billion. The biggest scam in this project was how it was marketed and sold to the voters with no realistic funding source for the remainder of the project beyond Bakersfield to Merced. It was also a bait and switch teasing both Sacramento and San Diego with future extensions just to obtain votes. What we have now is billions of dollars wasted that could have been used productively elsewhere. Alkali Flat looks to be in the planning stages for a commercial kitchen and food business incubator. 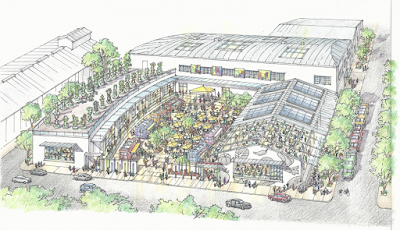 Comstock Magazine reports that the project has been in the works for three years with a target opening date of 2020. The 35,000 sf industrial block at 1425 C Street in downtown Sacramento. The block is not currently outfitted for food and beverage manufacturing. Its mentioned in the article that millions of dollars in big improvements would be needed as well as a big tenant with money and concrete plans to pay for building the kitchen, safety features and other big improvements. 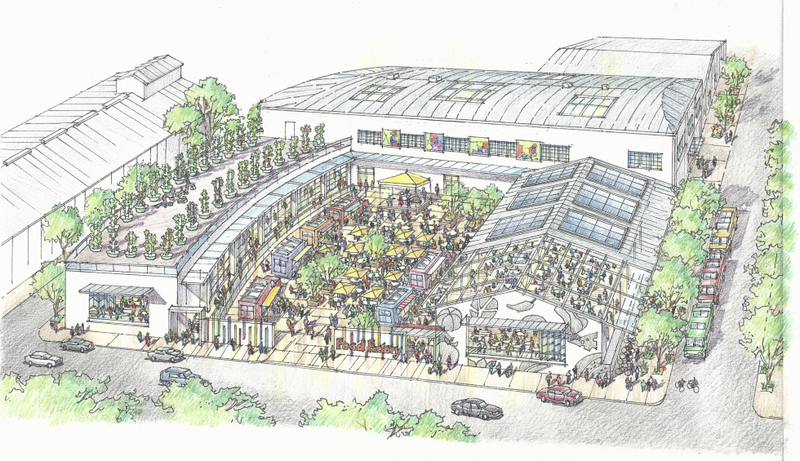 The Food Factory would also host events for the public that features members products as well as music and other entertainment. 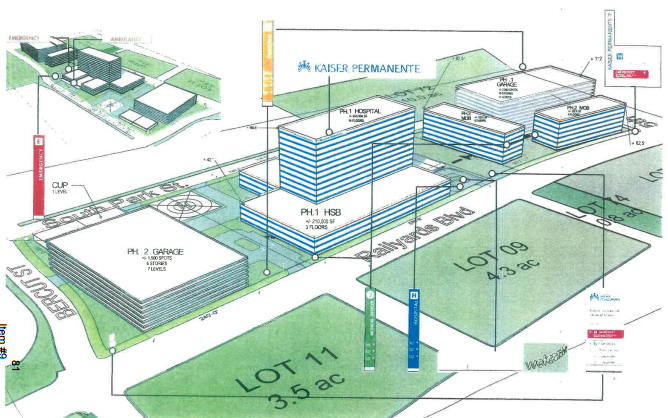 Nearly 2 ½ years after Kaiser submitted plans to the Planning and Design Commission to build a hospital in the railyards, Kaiser has announced the purchase of 18 acres for $33 million. Entitlements began in 2015, hopefully construction will begin soon now that the land has been obtained. The first phase of the will cost $749.5 million. Plans call for the 14-story hospital to include 420 beds as well as a large medical office. No date has been set for when construction will begin. Below is a map showing the current building height map, it appears most of the land is unrestricted.